2. The carrier segment's upper holder holding the caps is now lifted separation of cap and body is assisted by vacuum. 3. The upper holder starts retracting while the lower proceeds to the dosing station. 4. Complete retraction of the upper holder is done at this station. 5. Powder slug is inserted into the capsule body; when there is no capsule body held at the lower holder, the powder slug will be further pushed downward and collected in a receiver tray. 6. Two station reserved for attachments to fill pellets or other granulated products. 7. 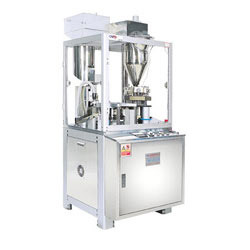 Two station reserved for attachments to fill pellets or other granulated products. 8. Ejection of un-separated capsule or the up-side-down capsule caps is performed with an aid of 5upward stroking rods. 9. Upper holder starts moving outward to the position above the lower holder. 10. At this station, while upper and lower holders are closely matched the capsule bodies are pushed upward into the caps by 5 steel rods. 11. Now the closed capsules arriving at this station are again pushed upward by the other 5 steel rods and leave the carrier segment. 12. Carrier segment is vacuum-cleaned and proceeds to the capsule insertion station. 2. Capsule size: #00, #0, #1, #2, #3, #4, #5. 3. Power supply: 220/380V , 3 PHASE , 50/60Hz. (for customer to designate). 4. Power consumption: 220 V 12A ; 380 V 6.6A. 5. Main drive: 1 HP 3.6A. 6. Auger drive: 1/4 HP 1.2A. 7. Vacuum pump: 1HP 3.6A. 8. Net weight: 850 KGs. 9. Cross weight: 1,000 KGs. 10. Dimensions: 815 x 905 x 1,958 mm (L x W x H). 11. Export packing: 1,450 x 1,030 x 2,060 mm (L x W x H).